HBSCA and Corpus Christi School join to participate in the 2013 Children’s Parade for the I-Fest! For over five years the HBSCA educational program has been very active in the Houston International Festival. As part of this educational program, each year a member of our association chooses a Houston area schools and educated the children at the school about Azerbaijan and the Azerbaijani language. This year our members, Arifa Bixby, Director of the Women’s Committee, and recently joined community member Konul Baltas visited the Corpus Christi School in South West Houston to teach the children about the culture, history and people of Azerbaijan as well as the language. 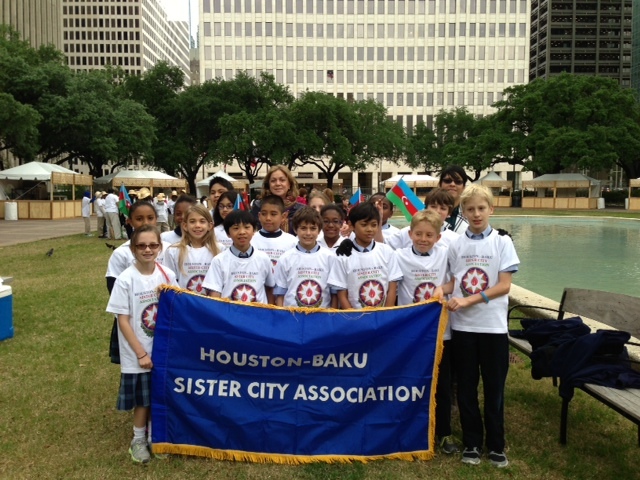 Continuing on this program, the children from Corpus Christi School participated in the Children’s Parade where they represented Azerbaijan and the Houston Baku Sister City Association. They greeted the guests with a newly learned Azerbaijani greeting. 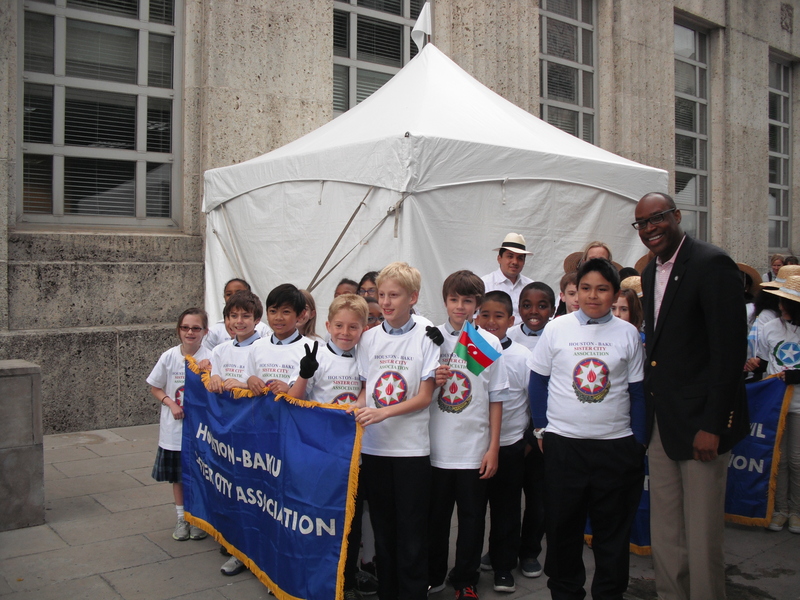 HBSCA donated specially made shirts with the symbol of Azerbaijan on the chest to stand out to the audience. During the parade, city officials including Mayor Pro Tem Ed Gonzalez, Councilman Jack Christi, Councilman Larry Green and Councilman Jerry Davis were present and addressed the audience regarding the importance of the relationships between the sister cities and their economic and cultural importance to Houston. The audience was patient as the children representing the numerous sister city associations gave a brief greeting to the audience. 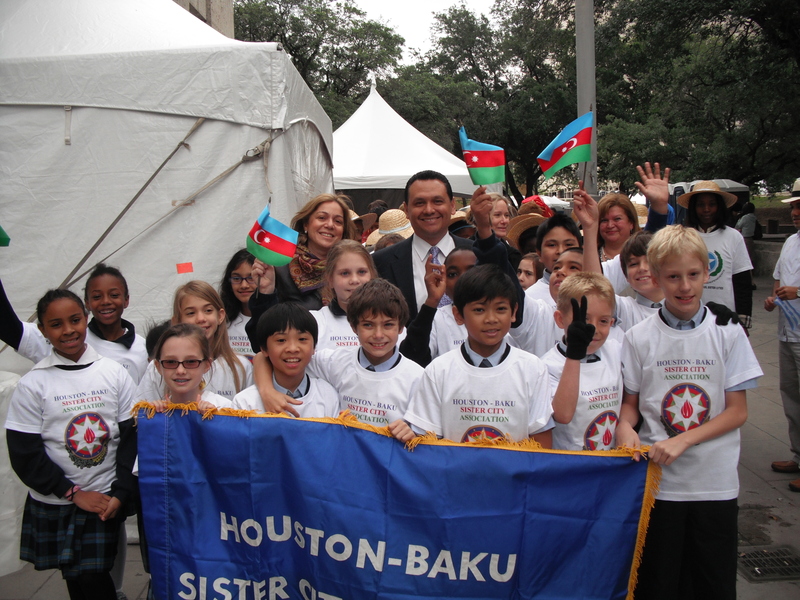 Children from the Corpus Christi school were introduced by parade emcee and KHOU Channel 11 News anchor Greg Hurst (see video below): “The students are wearing special made Houston Baku Tshirts. Baku and Houston have been Sister Cities since 1972…Baku is also a city known globally for its oil and energy commerce just like Houston, and the students would like to give you a greeting in Azeri” The student’s responded with a robust “SALAM FROM BAKU”! 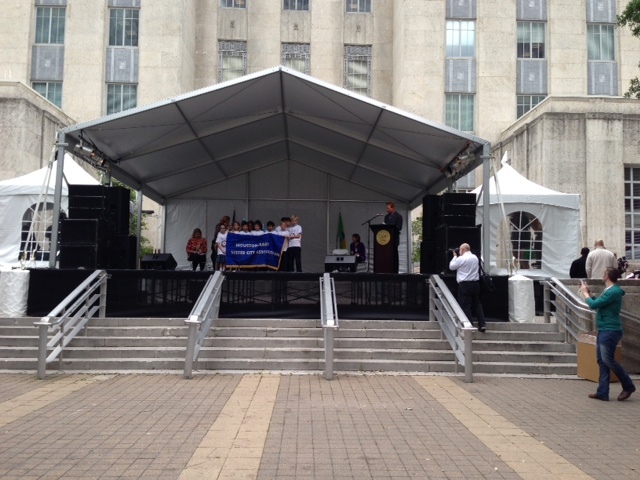 before departing the stage to watch the performances by the remaining sister city associations. We are very thankful for all parents and students from the Corpus Christi school and the community volunteers who worked with the children to make HBSCA’s participation in the 2013 Children’s Parade a success.